Fellowes, the leader in laminating products, delivers the best performance and quality to preserve and protect important documents. Fellowes laminators can be used in the home, office, or classroom for creating quick, long-lasting professional and fun projects. You can make menus, signs and posters durable. Quickly and easily laminate photos, business cards, picture cards, and certificates. Create bookmarks, calendars, flash cards, or jewelry with ease. Fellowes laminators feature robust roller systems for quick, consistent lamination and quality throughput at high speeds. By providing the best laminator technology we ensure smooth, high quality laminating results. 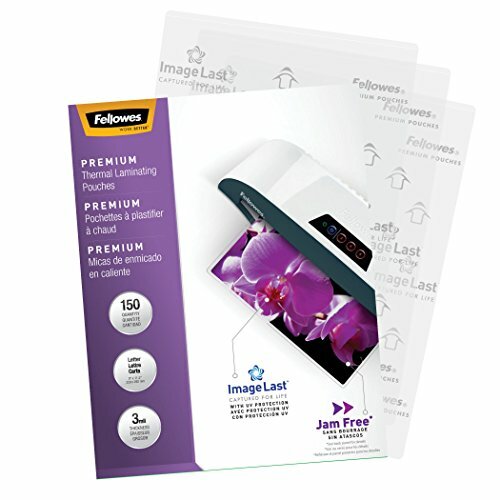 Fellowes Laminating Pouches preserve, protect, and enhance important documents. Premium quality pouches ensure clear, durable results. Simple and easy to use - just place document in the right pouch size and insert it into the laminator. Available in a variety of sizes. Compatible with all laminator brands.